Cast: Will Ferrell, Woody Harrelson, Andre Benjamin, Maura Tierney, Will Arnett, David Koechner. 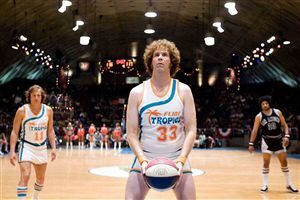 Semi-Pro is every bit as funny as Will Ferrell's other comedies, but many will find it one sports movie too many for Ferrell. When you look back over this movie, Talladega Nights and Blades of Glory, you may find it hard to remember which bits were in which movie. Not that I'm bothered about that, a laugh is a laugh as far as I'm concerned, but it almost certainly explains why it sank without a trace, with minimal promotion and practically no-one in the UK going to see it. In this one, Ferrell plays the player-owner of a 1970s basketball team fighting for a place in the NBA, and this is unmistakably a Ferrell movie, with the Ferrell character infused throughout. Big names Woody Harrelson and Andre Benjamin (from Outkast) are largely a waste of money, but if you like Ferrell's style there's more than enough to keep you chuckling. Semi-Pro is only going to appeal to existing fans of Will Ferrell's offbeat style - it definitely won't get him any new supporters. Whatever you thought of Ferrell's previous goofing around - this is more of the same. To enjoy this film you should be: in a giggly mood. Semi-Pro was released in the UK on 29th February 2008.